Yesterday, I wrote about the importance of Twitter and other social networks to catch real-time conversation of the latest news and updates from Haiti in order to stay informed and connected to those on the scene. Pictures are obviously enough to grasp the horrors of this situation. 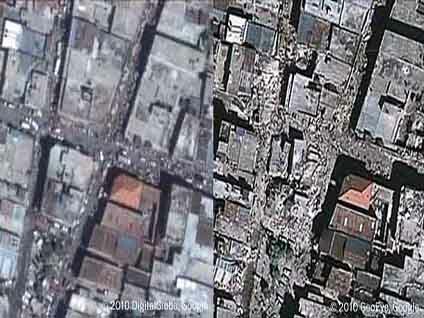 To get an even greater sense of the devastation, Google has partnered with geospatial imagery Geoeye to reveal a birds eye view of Haiti before and after the earthquake. Facebook has also become the epicenter for live online conversation. According to their team, since the earthquake there have been over 15000 status updates per minute that contain the word "Haiti." The quake occurred at 4:53 and in the first minute, 106 people updated their status with something about the word earth or 'tierra', which was followed by an average of 300 updates in the next two minutes. Beyond their official page, others groups have also emerged from the crisis including, Earthquake Haiti with almost 105,000 members, as well as Haiti Needs Us, And We Need Haiti. Facebook Causes applications linked to the cause have also popped up, allowing users to choose certain non-profits and donate directly to them through the site. You can donate and do your part through Wyclef Jean's Yele Haiti, which has also raised over $400,000 over text messaging (text "Yule" to 501501 to donate). Oxfam is also making an impact, with users joining the cause, donating and passing on the link to friends within their social network.